All of Bitcoin's attempts to break above the long-term resistance line since its peak of $20,000 have been met with rejection. Since July 24 Bitcoin has attempted to break above this resistance on two occasions and has been rejected both times. On the support side Bitcoin Bears have attempted to break the cryptocurrency below $5800 on three occasions since February. This presents a difficult position for traders as both the bears and the bulls have been weakening each others strongholds consistantly since February. In the short term Bitcoin looks bullish and is likely to challenge the long-term resistance line at $6800. Traders beware as the lack of volume is extremely concerning for the bulls cause and there is a good chance for rejection, yet again, at the long-term resistance. 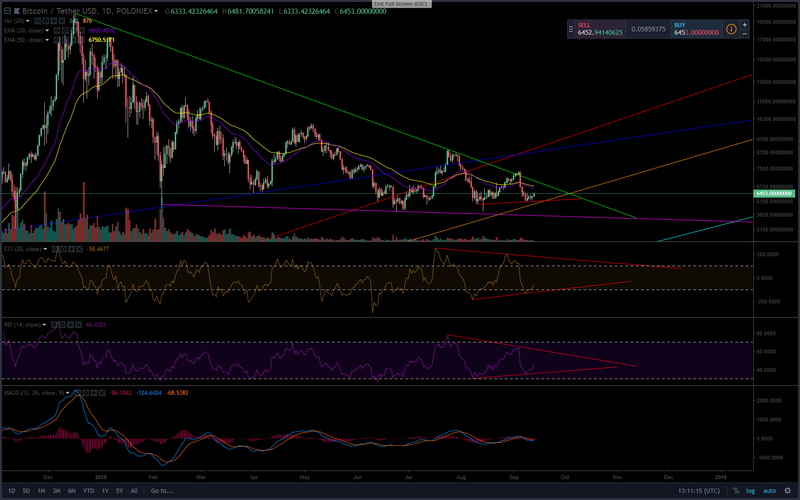 Long-term Bitcoin still remains bearish and is likely to see a dip to $5,500 before the bulls are able to consolidate and exhaust the pressure of the bears. With Bitcoin Shorts nearing all time high's once more on Bitfinex the likelihood for a short squeeze in the near future is likely as the price pushes up and these positions close out. We will consider longing Bitcoin if it is able to break above the long-term resistance of $6800 and sustain for three days as this will show the bulls are presenting enough consolidation and support to challenge the bears effectively. If Bitcoin is unable to sustain above the resistance level we will look to short Bitcoin to the $5500 levels, and quite possibly as deep as $5000 since a fourth hit on the support level that has been established since February is likely to succeed and pull the price of Bitcoin further back.